1 Jacobus, Donald Lines, The Bulkeley Genealogy: Rev. Peter Bulkeley, Being an Account of his Career, his Ancestry ..., New Haven, Connecticut: unknown (1933), 371-372, Heritage Quest (Digital Library). 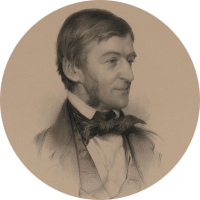 4 Wikipedia, "Ralph Waldo Emerson", (accessed 01/09/2014). 5 Wikipedia, "William Emerson (minister)", (accessed 01/09/2014).